At various sports and cultural activities and competitions, everyone really does get a medal - it's almost laughable. The idea that there are winners and losers is deemed somehow too harsh. In my son's martial arts dojo, passing to a new belt rank is systematic every few months, regardless of how much karate the kid has actually learned. 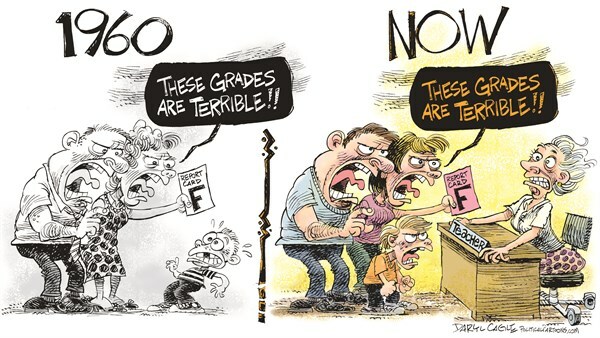 Standardized testing in schools is seen as some sort of fascist evil by many parents and educational institutions. Presumably each child is unique and special in her/his own way and evaluating them against the same set of challenges and questions is somehow unfair. Positive reinforcement and protecting the child's self esteem seems to take precedence over discipline. You don't say "You've been a bad boy", you're supposed to say "What you did is not nice". You're not supposed to criticize the kids, instead you need to ask for their reasons and try understand their point of view. Negotiation and explanation are to be used at all times instead of reprimand. I call this "mainstream", because it is supposedly a mainly white/anglo approach (I myself am of mixed Irish and Arab descent). Amy Chua contrasts this with the more disciplinarian and traditional approach that Asian-Americans supposedly take with their kids in her notorious "Battle Hymn of the Tiger Mother". I object to this approach and my friends are always surprised by this, since my political views are usually to the far left, and this school of parenting and education is somehow associated with liberal and left-leaning thinking. Can this approach to parenting and education be traced to a recent philosophical movement or principle in particular? Why is this approach somehow associated with liberals and the left? Afterall communist Eastern European countries tended to be much more demanding and disciplinarian in their education than Western countries. The modern approach then, generally seen as 'child-centered' rearing, starts from a clear reversal of those attitudes, and is (in dialectic style) an abject overreaction, even by the standards of its originators. Three schools in this vein represent much of its philosophical base: John Dewey, Maria Montessori, and the Child Psychiatry movement initially within Freudianism, but later its continuation as part of Developmental Psychology within Clinical Psychology in general. Dewey's concern was to move education away from indoctrination and make it what we would now call a 'feedback loop'. But this was transformed quickly into a focus on taking leadership from the child. Within his lifetime, Dewey had already had to start arguing against his followers on this point, but the less tempered form continued to have a strong effect on teaching. Montessori's concern was to optimize the opportunities for growth in the child, instead of trying to create them. She pointed out how following cues from the child is much more efficient than trying to create focus artificially. Her motivations were very young children or children of low mental age, for whom traditional education was a bad fit. But efficiency is hardly the problem for an ordinary child. There is more than enough time and resources for us to grow up. Coverage of the range of things one should focus on becomes more of an issue. This is especially obvious when you step back from professional education, which consumes the time of highly trained people, to parenting, which involves huge tracts of time one can almost not manage to waste (although that is changing a bit in single-parent or double-income families, time is not really the issue). As expressed abstractly, these things point us in a direction of less and less rigidity and reactivity in addressing children, and pressures parents to be more and more protective and gentle. But in practice, although true, they are somewhat self-contradictory, and they are overemphasized to the degree they were striking at the time. The major impediment to using them abstractly is that some components of resilience are learned as much as any other skill, and untested skills are not well internalized. Nathaniel Branden, the original popularizer of the word 'self-esteem' spent much of his later life resisting the unbalanced notions that people had about the concept and the damage he felt was being done to education and parenting in his name. The deepest problem, here, as I see it, is that like much of modern psychology, it originates in solving the problems of those at both extremes of accomplishment, rather than deriving direction from normal functioning. Other than Dewey himself, these workers generally tried to leverage successes with the disabled, or with those bored and disaffected by the weakness of the curriculum into a general plan that would be deployed mostly upon people far from either of those extremes. At the same time, these are educational philosophies, aimed at educators, not parents, and the separation of teaching from parenting is lost by many practitioners who got their inspiration from wards of the State, or children who otherwise could gain little from their parents. Not the answer you're looking for? Browse other questions tagged psychology sociology social-critique or ask your own question. What is the Special Flower problem? What is virginity from a philosophical perspective? What is going in our mind if we can not apply previous successes to current situations? In a way, isn't everyone biased somehow? What is the philosophy of terrorism?